The all new Feiyu G6 Plus is not only small but smart. With it compact and lightweight design, it can supports all kinds of cameras less than 800g, easily fit GoPro, mobile phones, Sony RX100 series, mirrorless camera and compact camera. Feiyu G6 Plus unique multi-functional "Magic Button" allow you to create unlimited possibilities. By connecting the Feiyu ON App, you can use the "Magic Button" to precisely control the zoom/focus function of the camera, or precisely adjusts the rotation of the panning, rolling, and tilting axis of the gimbal. Connected to compatible devices through WiFi, you can control the major functions of the camera like photography, zoom, focus function, and adjust the ISO, White Balance, Exposure values and other Parameters, by switching function mode, never be so easy. The battery of the Feiyu G6 Plus (Li-Ion 26650) lasts up to 12h and is replaceable. The roll axle motor, which is bent by 35° also ensures that you have the screen of your camera at all times in full view and you will not miss a cool shot. New iterative stabilization algorithm with high-accuracy, low-power, high-effective motors offers higher accuracy and shorter response time. With its clear OLED display above the central control unit, the Feiyu G6 Plus gives you quick access to battery status or the current recording mode. The Feiyu G6 Plus is made of high quality aluminum with splash protection thus allowing you to safely use it in rain, snow, or near splashing. Furthermore, the grip rubber ensures that you always have a firm and secure grip. The Feiyu G6 Plus offers a parallel Bluetooth and WIFI connection. Thus you can control your camera (eg your GoPro) over WIFI and among other things adjust the camera settings as well as start and stop the recording. Via Bluetooth, you connect the Feiyu G6 Plus Gimbal to your smartphone on which you have installed the free App Feiyu ON. Via the app you have access to all settings of the Feiyu G6 Plus. You can also upgrade the firmware or start time-lapse recordings via the apps. 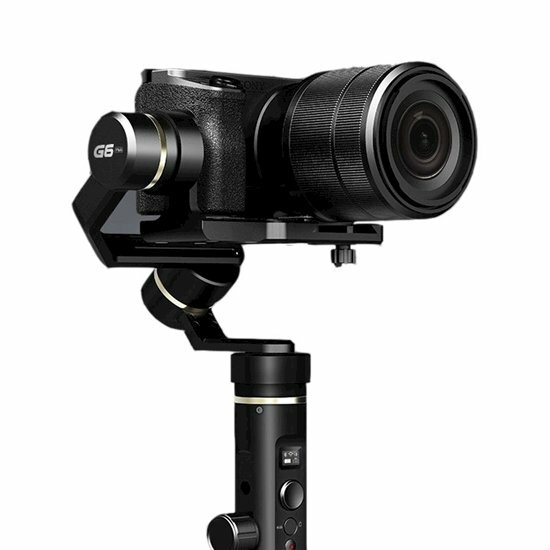 The Feiyu G6 Plus gimbal also has two additional 1/4“ threaded connections for accessory use. On the laterally mounted connection is recommended, for example, the installation of your smartphone or an external microphone/light. At the lower threaded connection, you can add a tripod stand allowing you to do motion controlled time-lapses with the Feiyu G6 Plus and your device.